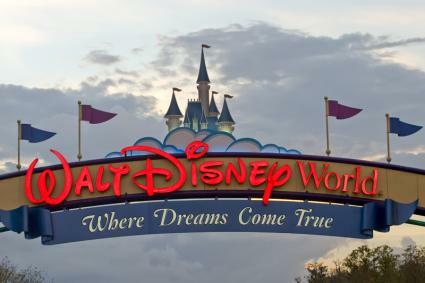 Disney World's featured rides may change as old rides are discontinued and new rides are added to the mix, but one thing is for sure: there are plenty of rides to please everyone, from young to old and from timid to thrill-seeking roller coaster fans. Although Disney World has rides scattered across Epcot, Hollywood Studios and the Animal Kingdom, the Magic Kingdom is the main location for riding fun. The Magic Kingdom is the quintessential park everyone thinks of when they hear Disney World. It is home to classic parades, Cinderella's Castle and many attractions. It also features the largest number of rides of all the Disney World parks. From a fun jungle cruise to the wild adventures surviving on a deserted island to the danger of pirates, Adventureland offers a gateway to a number of family favorites. The ten-minute ride takes the family on a floating tour of four continents. What makes the ride fun are the live "jungle guides" who narrate the script, but often ad-lib as well. It's a fun and funny ride. Wait Time: Varies from 20 to 60 minutes, although it can reach 120 at peak times. Age: Appropriate for the whole family. 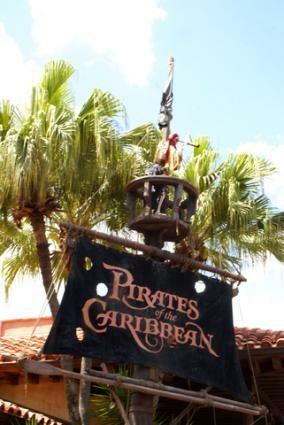 One of Disney World's most famous attractions, the ride inspired a series of films and the ride itself has been updated to include Captain Jack Sparrow. Kids will enjoy the wait and the ride through the battle with pirate ships booming and pirates singing. Wait Time: Varies between 20 to 60 minutes. Based on the live-action Swiss Family Robinson films from the 1960s, the tree house represents where the family lived. This is a walk-through experience. Wait Time: Almost none, visitors may stream through continuously. Age: Appropriate for the whole family, but involves a lot of climbing up stairs. Access may not be available for those with movement restrictions. Populated by a wide variety of rides and attractions, including some brand new attractions opened with a major renovation in 2011 and 2012, Fantasyland is popular with the very young and very old alike. An updated twist to the original Barnstormer at Goofy's Wiseacre farm, the new ride features Goofy as a stunt pilot at the circus. Families will enjoy the spiraling roller coaster feel. Wait Time: Wait times vary but can be as long as 60 minutes at peak times. The classic ride has been updated with the renovations and to enjoy a new experience. The area also features a waiting line with a circus themed-play area. Parents receive a pager to hold their virtual place in line and kids can play in the air-conditioned recreation area. The gentle boat ride takes visitors through a gallery of over 300 brightly colored dolls singing and dancing to the tune of It's a Small World. The dolls represent about 100 different nations and the song is sung in five different languages. Wait Time: Varies between 10 and 60 minutes, can go as long as 90 minutes during peak season. This newer ride is located where 20,000 Leagues Under the Sea ride used to be. On the ride, guests will embark in a clamshell vehicle on a virtual journey through special effects and have encounters with familiar characters like Ariel and Flounder as well as Ursula the Sea Witch. The princess Ariel may also be found in Ariel's Grotto for autographs and pictures. Wait Time: Wait time varies, but the ride features continuous loading. Age: All ages, no height requirement. 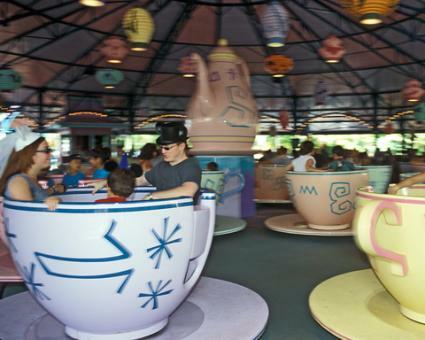 The teacup ride is a familiar favorite as families can turn themselves in circles. Each teacup has its own spinner; the faster you turn the wheel, the faster you spin. Wait Time: Varies with wait times as low as 10 minutes and as long as 40. Age: Any age, no height requirement. Children under 7 must be accompanied by someone 14 or older. This attraction is a theater-based, 3D experience. Families will enjoy Donald Duck's antics as he "borrows" Mickey's sorcerer's hat and hijinks ensue. Wait Time: Varies, shows last 12 minutes and occur several times an hour. Age: Any, no height requirement. Visitors will enjoy flying over London in a pirate galleon to far-off Neverland. The music from Disney's Peter Pan accompanies riders through the whimsical journey. Wait Time: Varies between 20 minutes and as long as 120 minutes at peak times. Located behind Cinderella's Castle, riders will enjoy classical Disney tunes as they ride the ornate carousel's antique horses around in circles. Wait Time: Varies between 20 and 75 minutes at peak times. Ride vehicles seat four and carry visitors through the slow-moving pages of Winnie the Pooh's adventures. Children will enjoy seeing familiar favorites like Tigger, Piglet, Eeyore, Owl and Rabbit. The old-time wild west theme is host to fun thrill rides and the popular log-flume ride Splash Mountain. This ride provides a rollicking runaway mine train through the gold-mining town of Tumbleweed. Considered a mild thrill, the ride includes some sharp turns and bounces. Wait Time: Varies between 20 and 60 minutes. Can go as high as 120 during peak times. Age: Children must be 40 inches or taller to ride. The ride is not recommended for visitors with high blood pressure, heart conditions, back or neck pain. Pregnant women are also not advised to ride. Join Brer Rabbit as he leaves home in search of a great adventure. 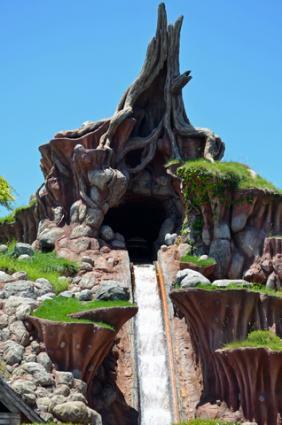 The log flume ride winds through the Briar Patch for before taking the long plunge to his laughing place. Age: Ages four and up will enjoy the ride. Passengers must be 40 inches or taller to ride. The landscaped outdoor playground is a great place for kids to run off some excess energy and play. Parents will enjoy the shaded areas and a break from the crowds. First thing in the morning, Imagineers hide six paintbrushes on the isle, if children find them, they get a free fast pass to the front of the line for Splash Mountain or Big Thunder Mountain Railroad. Wait Time: Varies, but passengers need to wait for the raft. Age: All ages, but children under 7 should be accompanied by someone 14 or older. Mostly filled with shops, Liberty Square is a nod to America's colonial times. The delightful ghostly romp through the 18th Century mansion includes costumed hosts who greet visitors and show them through to their 'hearse' vehicles. The special effects include an entire ballroom with dancing ghosts. Wait Time: Varies between 20 and 60 minutes. At peak times may last up to 90 minutes. Age: All ages. Children under age 7 years must be accompanied by a person age 14 years or older. The scenic, 17-minute riverboat ride takes visitors for a tour around Tom Sawyer Island and past the Thunder Mountain Railroad. It's picturesque and restful, though teens may not enjoy it. The rides and attractions that can be found at Disney World's Tomorrowland are based on futuristic adventures or more current day fare. Built in 1974, the ride provides an adventure in a rocket ship. The ride is located in the top of the building that houses the Tours and Transit Authority and requires an elevator to reach it. Once aboard, you can see all of Tomorrowland. Wait time: This ride always has a significant wait time. Age: Children age 2 till preteen. Based on Buzz Lightyear's adventures in Toy Story, riders are treated to several scenes as Buzz battles Zurg. In each scene, you must hit the targets to accumulate points. Wait time: Wait time varies between twenty and sixty minutes for the ride. Age: Ages 2 and up. Fun for the whole family. A continuous ride, the Carousel of Progress opened in 1975 and treats riders to an animatronic show as an American family travels through time. Various positives and negatives to technology are presented. Age: Appropriate for all ages, although teens might be bored. Stitch's Great Escape featuring the popular character from the Lilo and Stitch films replaced the Alien Encounter attraction. The idea is to be on a routine mission when Stitch escapes. Visitors may experience some nervous moments when Stitch breaths against them and pushes down as he races across heads to escape. Wait Time: 20 to 60 minutes and may be as long as 90 at peak times of the year. Age: Not suitable for small children. Riders must be 40 inches tall to enter and the ride takes place in the dark. Highly impressionable children may be frightened. A favorite ride for many, Space Mountain is an indoor roller coaster. Visitors will soar through the stars and see planets illuminated in the vastness of space. Several high speed dips, turns and dives occur during the ride. Wait time: Considerable anywhere from 20 to 60 minutes and as long as 120 minutes at peak times. Age: Not suitable for very young children or adults who are pregnant or with back or neck problems. You must be 44 inches or taller to ride. With the Tomorrowland Indy Speedway you're on a race to win the Intergalactic Speedway cup. With this ride you and your child will find yourself in a gas powered race car whipping around the track at approximately five miles per hour. The track does have a rail, so your child will not be able to drive off the track. Wait Time: Considerable wait time between 60 and 120 minutes. Age: Suitable for children ages four and up, but you must be 52 inches or taller to ride unaccompanied. Parents are able to ride with children who do not meet height restriction. This ride is a slow-paced ride that tours around Tomorrowland. Visitors will enjoy a sneak peek inside Space Mountain and Buzz Lightyear's Space Ranger Spin. It's ideal for cooling off and giving aching feet a break. Age: Appropriate for all ages. Teens and older children may be bored. Opened October 1, 1982, Epcot Center (later named just Epcot) was the second park to open in the Disney World complex. Dedicated to human innovation and engineering, the park is also home to the World Showcase with shops, restaurants and cultures featured from around the world. Often referred to as a permanent world's fair, Epcot hosts a multitude of events throughout the year. The slow-moving ride carries passengers through the geodesic dome on a journey through the history of communication. Wait Time: Varies, but ride loads continuously. The mission simulator ride takes the family on a voyage to Mars. The centrifuge-based ride includes simulating what astronauts might experience during take off and their journey. Wait Time: Varies 30 to 60 minutes. May reach 90 minutes during peak times. Age: For older kids, teens, and adults. Must be 44 inches tall to ride. This popular ride carries visitors on a simulated hang glide adventure over California ,including the feel of the breeze against their faces and the scent of oranges in the air. Wait Time: Varies from 20 to 60 minutes, but may reach 120 minutes during peak times. Age: Children must be 40 inches or taller to ride. Children under age 7 years must be accompanied by a person age 14 years or older. This multimedia adventure hosted by Ellen DeGeneres takes visitors from the big bang to dinosaurs and more. The shell ride carries visitors through Nemo's epic journey. Riders will enjoy seeing virtual representatives of Nemo, Dory and Marlin swimming amongst the live fish. Wait Time: Varies, but the ride loads continuously. Age: All ages, no height requirement. Children under age 7 years must be accompanied by a person age 14 years or older. This is a fanciful, virtual ride through the labs of the Imagination Institute with host Figment the Dragon. This boat tour takes visitors for a 14-minute tour of the Greenhouses and the research being done there. Wait Time: Varies, usually low. At the Hollywood Studios park, Disney World takes visitors behind the magic of the movies. The park provides an homage to the golden and silver ages of Hollywood along with more contemporary offerings, including interactive events like American Idol. Set inside a reproduction of Grauman's Chinese Theater. Visitors can see exhibits of costumes and props from classic films like Casablanaca, The Wizard of Oz, Mary Poppins and more before climbing aboard a ride that transports visitors through classic movie scenes. Wait Time: Varies between 20 and 60 minutes. Age: No height requirement. Children under age 7 years must be accompanied by a person age 14 years or older. Revamped in 2010, Star Tours is a 3-D motion simulator ride that takes riders through various parts of the Star Wars universe. Wait Time: Varies between 20 and 60 minutes, may reach 120 minutes during peak times. Age: 40 inch or taller height requirement. Children under age 7 years must be accompanied by a person age 14 years or older. One of the most popular rides at Hollywood Studios, FastPasses or this ride go quickly. Adventurers load up in vehicles and travel through a 3D virtual shooting gallery competing with their fellow vehicle passengers. Wait Time: 60 to 90 minutes and may reach 120 minutes or more at peak times. High speed roller coaster that accelerates rides from 0 to 60 in a few seconds. The music of Aerosmith accompanies riders as they zoom through Los Angeles, twisting and turning. Wait Time: Varies 20 to 60 minutes. Age: Riders must be 48 inches or taller. This is a thrill ride. Anyone who experiences back or neck pain or may be pregnant are advised not to ride. The thrill ride takes passengers up a freight elevator to the great beyond. The elevator drops and rises and drops again. The ride may be frightening for children. Wait Time: Varies 20 to 60 minutes and may go as long as 90 to 120 minutes during peak times. Age: Riders must be 40 inches or taller to ride. This is a thrill ride. Anyone who experiences back or neck pain or may be pregnant are advised not to ride. Located in the Norway Pavillion, the boat ride takes visitors through Norway's past and mythology. The most recent of the Disney World theme parks, the Animal Kingdom transports visitors to Africa and includes a wildlife Savannah and animal conservation. Several sections of the park are devoted to shows, character encounters, and animal conservation and exploration. Families will also enjoy the live Finding Nemo and Lion King shows performed at various times throughout the day. Be sure to check the schedule for times. The safari ride loads visitors into trucks and takes them on a scripted adventure through the Savannah where they can photograph zebras, giraffes, lions and more. Visitors may wander the Pangani Forest Exploration trail after the Safari returns. This thrill ride opened in 2010 to high acclaim. Visitors can enjoy the rocking, bouncing roller coaster through the Everest and may even glimpse the mysterious yeti. Wait Time: Varies between 20 and 60 minutes, but may reach 120 minutes during peak times. Age: Visitors must be 44 inches or taller to ride. Children under age 7 years must be accompanied by a person age 14 years or older. This is a thrill ride. Anyone who experiences back or neck pain or may be pregnant are advised not to ride. Visitors ride a 12-passenger raft up a 90 foot ascent through tropical forest before plunging them down the rapids, in a thrilling and wet ride through the lush tropical setting. Riders will get very wet. Wait Time: Varies between 20 to 30 minutes, but may reach 90 minutes during peak times. Age: Riders must be 38 inches or taller. Children under age 7 years must be accompanied by a person age 14 years or older. The time machine car takes riders for a dinosaur themed ride with hairpin turns, curves, and spins. Each car on the coaster takes its own ride. Age: Riders must be 48 inches or taller to ride. Children under age 7 years must be accompanied by a person age 14 years or older. This is a thrill ride. Anyone who experiences back or neck pain or who may be pregnant is advised not to ride. This thrilling ride carries visitors back 65 million years in time to catch a mild-mannered dinosaur. Flashing lights and thick jungle and danger threaten from all sides. Fans of dinosaurs will love this ride. Age: Visitors must be 40 inches or taller to ride. Children under age 7 years must be accompanied by a person age 14 years or older. This is a thrill ride. Anyone who experiences back or neck pain or may be pregnant are advised not to ride. The Wildlife Express Train leaves every 5 to 7 minutes and takes visitors to Rafiki's Planet Watch, an area dedicated to the preservation and conservation efforts. Visitors will enjoy the behind scenes look at the Animal Kingdom. Wait Time: Trains leave every 5 to 7 minutes. Age: No height requirement. Children under the age 7 years must be accompanied by a person 14 years or older. There is something for everyone at Disney World and sometimes rides are closed for refurbishment or repairs. Be sure to check with the parks when you arrive so you can make your stay the best one yet.